Knicket is the fastest and most comfortable search engine for apps and enables users to find the most relevant apps easier than ever before. As early as 5 months after its launch, Knicket has been used by almost 600,000 users and is already available internationally. Knicket has users from 193 countries and will be available in 11 additional world languages until the end of the year. Since there are already more than 2 million apps in the Apple App Store and in the Google Play Store, searching apps is becoming increasingly difficult. Each month, over 40,000 new apps are added. For many subjects, there are already dozens of apps today, and it is almost impossible to identify the best ones. In 2013, 100 billion apps were downloaded; in 2017, this number will likely exceed 250 billions. Number of Downloads from App Stores Worldwide. Source: Statista 2014. Moreover, Apple and Google are creating additional confusion by selecting apps in the app stores based on obscure criteria and on their obvious economic interests. Therefore, it is questionable whether the best search from the users' perspective is even what the major stores want. Indeed, for many subjects, there are free services as well even though fee-based apps are usually pushed. "You have to download 10 apps to find THE right one." "First, it says that the app is free, but then it isn't." "Searching for apps is really frustrating." These are only a few statements from a survey on app search in the app stores. An incredible 100 billion apps were downloaded from the two major stores in 2013, leading to revenues of roughly USD 27bn worldwide. In 2016, global revenues from apps will likely increase to USD 58bn (Source: mobiThinking). In 2013, revenues of EUR 717m were generated by means of apps in Germany alone; in the previous year, revenues came in at EUR 547m (Source: BITKOM, German only). Our co-founder Uwe Flade has developed several apps himself, which have sold several million times and were the "App of the Week" in the Apple App Store in many countries as well. Thus, he also knows the problematic approach of the app stores from a developer's perspective. Uwe Flade: "Even for a successful app company like us, it was impossible to find out which rules Apple and Google follow when emphasizing individual apps. Thus, small companies that do not have sufficient economic power or free apps in particular run the risk of being overlooked even though they may be more interesting to users." How, then, does Knicket improve the situation of everyone involved? Figure: Apple U.S. iTunes App Store Search Result for "Fitness"
The Apple U.S. iTunes App Store provides us with an overview of roughly 2,200 fitness apps, but which app are users meant to choose? iTunes does not provide an answer to this question. The selection cannot be limited any further, and helpful information on the user rating is not available on the overview page. Users are left alone with this rather imprecise result and may only get detailed information through trial and error and overly time-consuming research. On Knicket, users may limit the list of results in several ways and refine their search. Our database contains all Android and iOS apps on the market. Thus, Knicket enables users to access all apps available in the two major stores. After using our filters, users receive a very small and individual list of apps that they may not have seen in the app stores but that have a high quality nonetheless. Figure: Knicket U.S. Web Search Result for "Fitness"
The "tags" (keywords) next to the search box are suggestions for additional filtering: If one clicks "Personal Trainer" in our "Fitness" example, the list of results is already much more precise because it contains only 516 apps. Two more clicks on the keywords "Sports" and "Body Fat" reduce the number of apps to only 15 apps for weight loss. If one also sets the minimum user rating for the app to 4.5 stars, one gets a small and accurate list containing only 8 apps that perfectly fit our subject. This entire process is absolutely transparent, for we do not exclude a single app. The apps with the most suitable parameters rank highest, independent of their market dominance. If users want to increase the selection of apps again, they may remove individual filters, or they may use the price slider to further limit the list of apps – for instance by only searching for free apps. In this way, search results can be individualized in real time and are independent of mainstream choices by companies. Even though we have not invested a single cent in advertising or marketing, knicket.com has been used by almost 600,000 users from more than 193 countries so far. This proves that our concept of an independent search engine perfectly fits the time. Moreover, we are only beginning to develop features and added values, and we have a long list of add-ons that we will develop in-house in a resource-efficient fashion, test with some of our users, and only add to our website if the features are really useful. Furthermore, we have already implemented the first types of monetization, which will simply scale up based on the increasing traffic: As many as 12,000 downloads were made in the Apple App Store because of our redirection since the beginning of this year; since May 2014, app developers may display targeted ads, and there are subtle ads on all pages. Currently, Knicket generates ad revenues and commissions of roughly EUR 2.00 per 1,000 users and has 180,000 users each month. At the same time, our customer acquisition costs today virtually equal EUR 0 per 1,000 users because customers are primarily attracted through PR and organic traffic, i.e., traffic from search engines on our landing pages that we do not pay for. In this area, we have a huge initial advantage because many online services have to deal with customer acquisition costs of EUR 20 per 1,000 users or more. Because of the further increase of users, increasing awareness of Knicket, and further optimization of our target group specific way of addressing customers, we will become much more interesting to advertisers and expect revenues of EUR 6.00 per 1,000 users as early as in 2015. In the following years, we want to increase these revenues and the number of users significantly. Following a conservative strategy, we will increase our customer acquisition costs to approximately EUR 2.00 per 1,000 users within the same period. Even in this cautious projection, a very attractive contribution margin of roughly 66 % remains. Knicket has had an international focus from the beginning: We opted for English as our first language during prototype development last summer, and German will become the second language to be published in June 2014. Simultaneously, we ensured during the development and programming of Knicket that our website may be quickly and easily translated into additional languages – if we launch another language, e.g., Spanish, we only have to pay for two to three weeks of development work, the translation, and the server costs. In total, this amounts to only EUR 8,000 for each language. Consequently, since we can easily publish Knicket in all world languages, we are able to access a huge market. While people in Europe and the U.S. can hardly imagine life without smartphones today, the importance of apps in markets that have virtually skipped the PC age (e.g., India, China, Malaysia, etc.) is even higher. In these multi-billion markets, the internet traffic of apps is already higher than that of PCs (see also: Mobile Marketer). Knicket was founded in order to help people find the best apps and games on a specific subject more quickly and efficiently – in an independent and transparent way. Because of our filters and a database technology supported by the Investitionsbank Berlin (a public bank; www.ibb.de), users experience a fast and precise search for apps. Consequently, users may immerse themselves in the world of apps in an uncomplicated manner. Two filters in particular are very helpful, not only when searching for games: The age filter enables users to display apps based on the age tiers of the users. Indeed, adults searching for games not necessarily want to see the large number of games for children. Conversely, users searching for children's games may wish to avoid games that regularly require their users to buy additional components or similar things (also called in-app purchase). Users may prevent this by activating the corresponding filter. Thus, users may quickly and easily find the best racing games that are free and also suitable for children. People who like to search the classic categories of the app stores, for instance Apple's "Lifestyle" or "Medical" category, may do so on Knicket as well. The categories from the stores are also available on our website. In case users are already rather satisfied with the app they have selected but want to see some alternatives, they can use another unique feature of Knicket: Knicket AppMesh helps users find alternative apps similar to the one selected. This feature goes beyond the scope of the App Store feature "Users also bought" because our algorithm is more complex: It also considers user ratings, age ratings, and many other parameters in order to find the best recommendation. All apps displayed are related to the one in the middle of AppMesh. AppMesh shows the best-rated apps with similar features. The fact that these apps have been downloaded by the same users in the past is used as an additional parameter. All Knicket features also work on mobile devices and perfectly adapt to the various screen sizes of the respective devices. Knicket always remains web-based, i.e., users do not have to download a Knicket App from the Store. On smartphones, the web application looks like a native app (native apps are programmed specifically for the respective operating system of a smartphone) and acts that way as well. 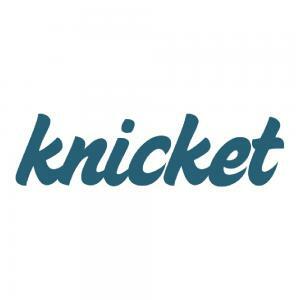 If users store the Knicket website on the home screen of the smartphone, the Knicket logo looks like that of a native app. Do you wonder why we are sure that the app stores will not add more features to their search and optimize it for their users? The editors of the app stores primarily focus on selling the latest apps. Lately, Google Play has even reduced the number of filters, similar to the way in which the number of filters in the Google web and picture search were reduced. The rationale behind this is to make users more likely to download something rather than to let them perform a detailed search, compare options, and carefully consider their purchase, which takes more time. In this respect, the two major stores are very much alike, and they apparently make in-depth filtering of search results impossible for a reason. Therefore, Google and Apple leave an interesting and profitable market to us without missing out on any revenues, for "our" downloads are done via their stores as well. Even if Google and Apple add an in-depth search to their respective stores, we are sure that there has to be an independent and intelligent app search engine that provides neutral results because users and developers in the stores can never know for sure which secondary factors of the monopolists influence the search. In the app stores of Apple and Google, it is impossible to display advertisements for apps. But how can app developers raise awareness of their app then? Consequently, the popular games and app marketer Applift compares the app stores of Google and Apple to the Panama Canal and refers to them as barriers because they are full of fierce competition and because it is difficult and expensive to penetrate them (see also here). The rapidly growing mobile games market alone has a volume of USD 10bn and is becoming increasingly important (see also here). For instance, the browser game producer Kabam generates most of its total revenues of USD 360m by means of mobile games. The publicly listed mobile game producer KING (known for the smartphone game Candy Crush among others) generated profits of USD 568m and revenues of USD 1.9bn. At the same time, the company invests USD 10,000 or more in marketing and advertising each day (!) (see also here). On our website, the ads are displayed precisely to the right customer currently looking for apps. We are the experts on finding apps, and we are able to perfectly place app-related ads. Moreover, due to our focus on apps, targeted ads do not annoy our users because they supplement the contents in a prominent position. On the pages of knicket.com, there is a download button for every app available for download via Apple iTunes (see figure below). Users who click this button are automatically redirected to the Apple App Store/Apple iTunes and may purchase or download the app for free there. If an app is purchased immediately or up to seven days later, Knicket receives a 7 % commission on the net sales price from Apple. b) We believe that our revenues in this area will be mainly based on advertising on Knicket.com because Knicket is the perfect environment for advertisers. Knicket knows the precise search behavior of its users, is able to analyze it, and may thus provide targeted ad spaces to advertisers. Here is a simple example of this specific targeting: An ad is only displayed to users in the U.S. who have an iPhone and are searching for games. This is an advantage both for conventional banner ads, which we are currently receiving from providers such as AdSense (www.adsense.de) and buysellads.com, and for app developers who book their own ads themselves or via agencies. Thus, by means of Knicket, we offer a solution that everyone involved is really looking for at the moment. Indeed, by using Knicket, app developers, marketers, and companies may finally increase the visibility of their apps and, as a result, the number of downloads. In this way, companies reach their target group in an efficient and transparent manner. The targeting process mentioned above may be expanded at will. For instance, companies may also select users who a) have purchased an app within the last 30 days, and b) have an affinity for traveling (visible in their search terms and the categories they have viewed). The more precise the targeting, the higher the prices for the advertiser will be – a concept that has been used for years in the case of Facebook ads and other ads. Precisely for this targeting, we will soon provide app companies with an exclusive space in addition to banner ads: the Knicket Sponsored App. By means of the Sponsored App ad space, companies may book a prominent position on the Knicket homepage and in the Knicket search results. For this purpose, the apps will be displayed if they match the search terms, and advertisers will only have minimum wastage. c) In the B2B (business to business) segment, Knicket may also be provided as a white-label solution. This means that, for example, other website providers use our app search engine on their website with their own name and pay a fee for this service. The leading German computer magazine CHIP has already signaled its interest in using Knicket as a white-label solution on its website. "The Knicket website is extremely fast and always up-to-date – something that is very hard to achieve for companies like us. Therefore, I also think cooperating with Knicket would be pretty interesting from a professional point of view: Knicket provides the data from the app stores, aggregates them in a new way, and we use them in our products." Generally speaking, all web services can be copied. However, we believe there are high barriers to potential competitors who want to offer the same range of features as Knicket. Simultaneously, we have noticed that the major stores, such as Apple and Google, are not interested in cooperating with us because they have different economic interests. As is true of most digital services, many Knicket features may essentially be reproduced. Nevertheless, we have developed Knicket based on state-of-the-art technologies and are supported by the Investitionsbank Berlin (IBB), which had the degree of innovation of our technology confirmed by means of an independent analysis. Our unique technology in the background ensures, among other things, that the speed of our desktop search is simply unique: Search results are displayed virtually in real time, and filter changes modify the results instantly. Our solution is also excellent from a technological point of view in many other areas, for instance in the aggregation of raw data from different sources and in the automatic generation of highly optimized landing pages (highly relevant to the inexpensive acquisition of users through Google search results, also called "SEO"). Due to the financial support by the crowd, we consider ourselves the independent and transparent search engine for apps. Our American competitor Quixey has received considerable funding from the Chinese product search engine Alibaba and works almost exclusively for American cell phone companies, which of course have their own economic interests. We, on the other hand, enable our users to create their own individualized search results using the Knicket filters. We are the only app search engine to offer filters such as the price slider, the age filter, the in-app purchase filter, and the minimum rating filter all at once. Our database contains all Android and iOS apps on the market. In the future, we will also display all apps that have been discontinued in the middle of 2013 or later on an archive page. The design and structure of our user interface are systematically tailored to the needs of our users. The combination of a simple and modern design, several filters, and high speed makes Knicket unique. Moreover, we automatically generate high-quality lists that cause us to rank very high in Google results. Another advantage for Knicket users is that they need not register to use Knicket. Even if users want to comment on an app, they are not forced to register on Facebook. In the case of XYO, the "social recommendation feature" works only if users sign up to receive a recommendation for suitable apps. It would be foolish to assume that users only come to our website due to the brand name Knicket. Each brand name first has to be developed and established. Therefore, it is important to us to be listed on the first page of search engines like Google so that many users discover Knicket through this single click. We have thus developed a number of SEO strategies. The "apps like" pages: If users google "Apps like Underworld Empire," Knicket already appears as the first or second entry in the list of results. We also want to optimize this for other apps and thus improve our Google ranking. Figure: Google Search Results for "games like underworld empire"
Our "best apps" pages display the best apps on certain popular subjects, for instance "best navigation tools apps for iPad." This happens automatically based on a complex algorithm developed by the Knicket team. Users do not have to set up any filters, and the lists are simultaneously added to the search results of search engines like Google as individual websites. In this way, Knicket becomes even more visible to users. By optimizing website URLs and adding more cross-references, we have been able to attract more organic traffic to our website via Google. In so doing, we have increased the number of users by 100 %. Uwe Flade is the founder, CEO, and creative head of Knicket. In his previous Berlin company, Shape Minds and Moving Images GmbH, which he successfully sold in 2012, he developed two of the most successful iOS apps for children worldwide. A former director of music videos for bands like Depeche Mode, A-ha, and Rammstein, he ensures that aesthetics play a vital role in the product as well. Martin Konradi is co-founder of Knicket and the company's CTO. An expert on crawlers, databases, search technologies, and linguistic data processing, he eagerly deals with tons of app data in order to structure them. He introduces the latest database technology to the company, developed the system architecture, and implemented the interfaces for the real-time user interface together with co-founder Erik Panzer. Dr. Thomas Jung is co-founder and CFO of Knicket. He is in charge of the company's finances, of the administration, and of the marketing (together with Uwe). A former employee of Deutsche Bank, Thomas quit his job in management of a trading unit for his love of technology and was immediately thrilled by Uwe's idea of a search engine for apps. He puts special emphasis on keeping a large number of processes scalable and enjoys the dynamics within his own start-up. Software architect and shareholder Erik Panzer (former CTO of Global Leads Group and now Product Owner at Tweek) serves as an advisor to Knicket. During the launch stage, he introduced agile tools and supported the team in implementing the user interface and developing the API. What Is the Current Status and What Will Come Next? The English version of our "product" Knicket has been available online since the beginning of 2014 and has included all apps from the American Apple App Store and Google Play Store from the beginning. Since our launch in November, as many as 500,000 people have used Knicket. Because of our strictly fact-based/KPI-based approach to development, we have already been able to significantly optimize essential factors, for instance the churn rate (Δ 10 %) and the number of pages per session (+18 %). Since April 2014, a special interface has also enabled users to use Knicket in a comfortable way on smartphones and tablets. In early June 2014, we launched the German version of Knicket. How Is the Crowdinvesting Capital to Be Used? We want to use the funds raised through crowdfunding to turn Knicket into one of the top websites in the mobile segment within 12 months by increasing the number of languages offered (and of the related app catalogs), increasing the content depth, and increasing the number of targeting options for advertisers. In so doing, we will also follow a lean approach after the Companisto campaign and still consider ourselves a very cost-efficient start-up. Since we will not have any costs for acquiring users (customer acquisition costs make up most of the costs of most start-ups) over the next 12 months either due to the constantly increasing catalog of highly optimized multi-language landing pages (SEO), we will be able to invest almost every euro in the most important thing, i.e., the further development of the platform and additional productive resources (development, design). 1. Translate Knicket into the 12 world languages: English, German, Hindi, Chinese, Spanish, French, Russian, Portuguese, Arabic, Japanese, Korean, and Bengali. In so doing, we will reach three quarters of the world's population from our Berlin office and do not have to be present in the respective countries. We can manage marketing and PR from Berlin, which makes this step particularly efficient. We will then be present in all rapidly growing markets. 2. Improve the Knicket interface for mobile devices/apps: Due to a special interface, Knicket also works on all smartphones and tablets. Depending on the progress of technology, we want to improve this interface or replace it with native apps, i.e., with specially made Knicket apps. 3. Focus on features increasing the stickyness (users return to Knicket more often) and the depth of the content. This includes a "deal monitor" for apps whose price has been reduced. Also, we can easily implement contents such as awards won by the apps and historic and current stats concerning the number of downloads and rankings. How Can Companists Support Knicket? All Companists who have their own blog or website may add a link to Knicket, which improves our Google ranking and raises awareness of Knicket. If you want, we can also provide you with various banners and logos. Please just email companist@knicket.com. We are looking forward to receiving your suggestions, criticism, and ideas concerning Knicket. Tell us how you use Knicket and what thrills you or what you are missing. We are open to any kind of feedback and are looking forward to receiving it – also via feedback@knicket.com. All Companists are welcome to become active supporters and brand ambassadors of Knicket. We and all other Companists would be glad if you also told your friends about knicket.com and the Knicket search functions. Finally, feel free to add the Knicket web app to the home screen of your smartphone. iPhone/iPad: Go to knicket.com in Safari and press the share key. Then, select "to the home screen." Android: In the browser, go to knicket.com and add it to the start screen. In other browsers, please go to knicket.com, open the menu, and select "save as bookmark." In the following menu, you may then choose in the last menu item where and how you want to store the website. Select "start screen" and save. Of course, we will inform all Companists of new products and company news, for instance concerning cooperation agreements, in a timely manner. We are looking forward to receiving your support and cooperating with you.